The Red de Evaluación de las Dimensiones Subjetivas de la Vulnerabilidad (REDISUV) Chile-Europe builds a project work that will enhance ad enlarge the scientific knowledge of the Núcleo Milenio “Centro de Investigación Vulnerabilidades y Desastres Socionaturales” (CIVDES) [Vulnerabilities and Socio-Natural Disaster Research Center] regarding vulnerabilities and tools used for their evaluation. The network depicts a platform to solve a gap, in the Latin-American scientific knowledge, about the inclusive and operative categories necessary to evaluate the subjective dimension of vulnerability. According to this perspective, vulnerabilities are considered as the result of social, economical and political conditions in which all the population is involved, both in a individual and collective form. In this sense, the network main aim is to create theoretical and methodological framework to improve the comparative studies of the subjective dimension in vulnerabilities in Chile and Europe. The first meeting took place in Paris [Maison des Sciences de l’Homme Paris Nord], the 21st of June, at the international seminar “Subjective dimension of the social and territorial vulnerabilities. Effects for the logic and politic preventive intervention“. You can check the program of the day and the argument of the seminary. The second seminary took place in Bologna [Alma Mater Studiorum University], the 5th of September, and it was called “Invisible Life. Subjetive dimension of social vulnerability”. You can find here the call for paper and the program of the day. The participation is free, and open for all. 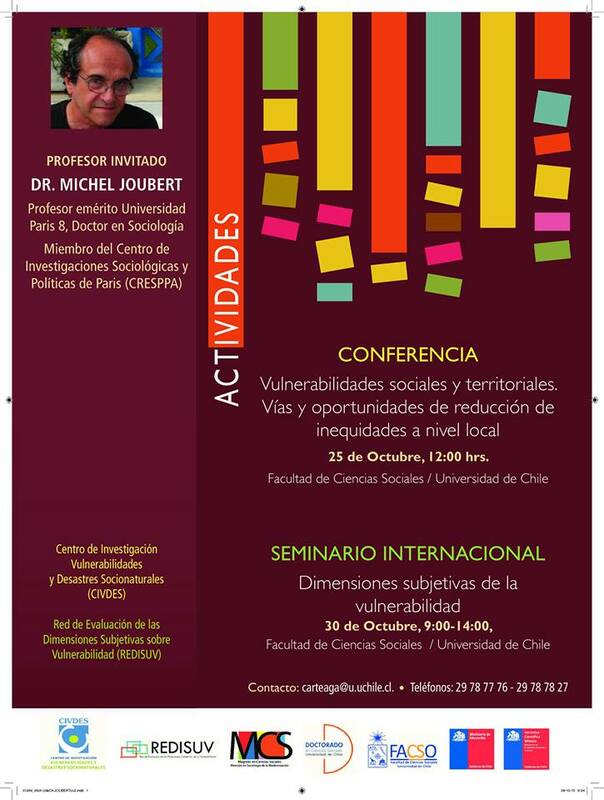 The third meeting will take place in Santiago de Chile [Facultad de Ciencias Sociales de la Universidad de Chile], the October 30, at the international seminar “A New Social Question? The subjective dimensions of vulnerability“. You can check the argument of the seminary and the program.